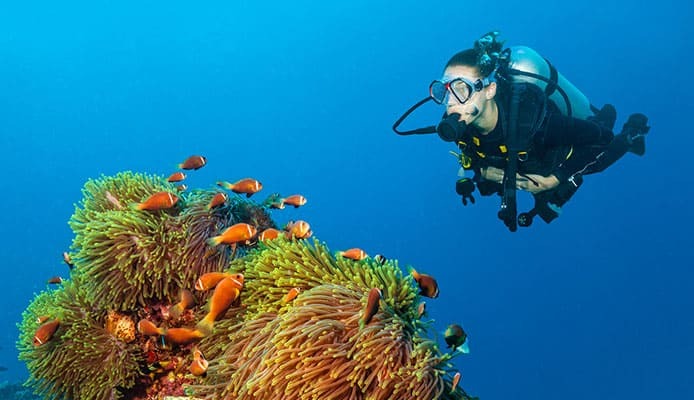 When your diving as a pair or part of a group, being able to communicate with your fellow divers is essential. 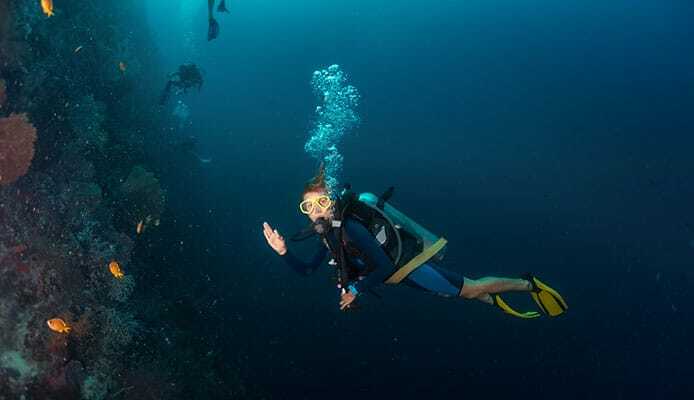 Although there is a system of hand signals that you should learn as a beginner diver, sometimes dive slates are required to communicate more complicated messages. Although it may not be necessary on every dive, underwater writing slates can becomes a key part of your dive safety gear. Check out our reviews of the top-rated dive slates below and see what product features will work best for you. The Trident underwater diving slate is great for those divers who like to go a little deeper. The glow on the dark feature means that your messages stay clearer at lower depths, day and night. The Promate underwater writing slate comes from a brand with a reputation for good design and manufacturing. With glow in the dark and compass attachment options this dive slate also features a clip for easy removal. A slightly more expensive option, this dive slate is perfect for the diver looking for a little bit extra. Our favourite dive slate due to it’s small and compact size. This dive slate also features the easy to remove clip that really makes a difference to accessibility when you get underwater. All of this functionality wrapped up in an amazing price tag makes this slate an excellent choice for beginners. Innovative Scuba Concepts is a brand that cares deeply about scuba diving, and by creating products for 25 years it has developed a reputation in the industry. 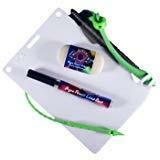 This underwater writing slate features a magnetic board which is far easier to wipe clean than typical writing slates. 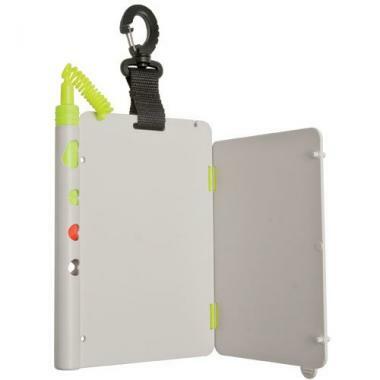 Highly functional and well designed, this sturdy diving slate also comes with a holster, split ring and swivel clip. We like this dive slate due to it’s color options and magic eraser. The Xit 404 diving slate has solved the biggest problem divers have with underwater slates by including the underwater eraser. You’ll no longer be scratching the pencil off your slate as the eraser removes all markings with ease, keeping your dive slate looking fresher for longer. Another product from innovative, this multiple surface diving slate is representative of the high-quality design the brand is famous for. The multiple surfaces make it perfect for use as an underwater pen and paper and the clip-on attachment means that quick removal and attachment is easy. 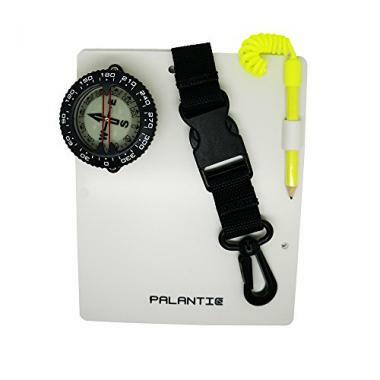 The Palantic scuba diving slate is the second slate featuring a compass attachment. For those that often find themselves to be the navigator of the group this slate should be up for consideration. The pen is easily replaceable and is attached to a bright safety leash so should always be easy to find. The easy to remove clip on clip allows it easier to detach the slate from your BCD. Promate have produced a really excellent wrist diving slate. 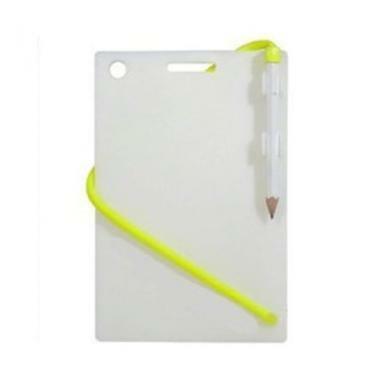 The Velcro strap means that the slate stays securely fastened to your wrist, whilst the multiple writing surfaces means that you have plenty of room to send multiple messages. 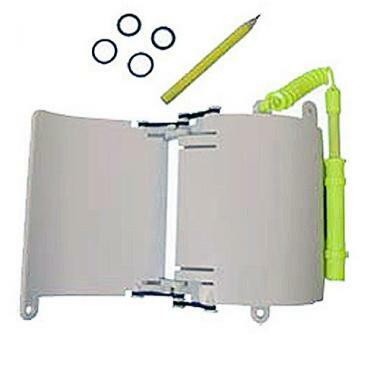 Promate have even included a spare pencil, which is easily attachable to the dive slate to prevent loss. Attaches ergonomically to a divers wrist. There are numerous types of slate, although all follow the same premise, recording information underwater. They vary in size, the way they attach to your diving apparatus and how you erase them. Typical dive slates are the simplest. Generally, a simple tag of plastic that can be fastened to a BCD. 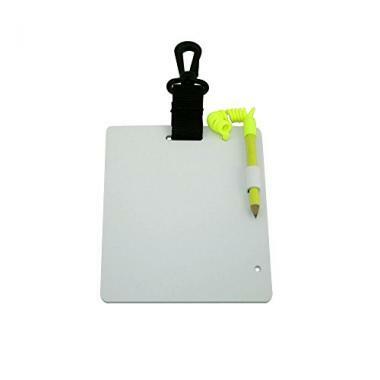 Write on these with a pencil that comes attached with a piece of string or plastic coil. There are a few other variations that may seem simple but can really help save time when rummaging around for gear or attempting to show a colleague a message. Quick clip attachments and compasses feature in the more expensive options to provide an extra level of utility. Whereas typical dive slates clip onto the BCD, wrist diving slates are strapped to the wrist with a Velcro strap. This feature serves two functions. Firstly, the slate is constantly accessible and ready to use. Secondly, the wrist provides a stable platform on which to write your message, meaning that instead of a jumbled mess, your message is actually readable. If you find yourself sending a lot of marine messages, this may be the choice for you. Erasable magnetic dive slates were developed to solve the problem of difficult to wipe slates. It can be easy for dive slates to become dark and difficult to read after sending multiple messages, whereas magnetic dive slates are erasable at the touch of a button. Often bulkier than the other slates, these are built similar to a smaller version of an etch a sketch. A well-engineered but seemingly more traditional approach. Waterproof notebooks and paper have a number of strengths over its competitors. Less bulky, with more room to right on, a diver can fill multiple pages with notes and observations. Waterproof paper is probably the best underwater writing device for those recording scientific observations or who like to make detailed notes. 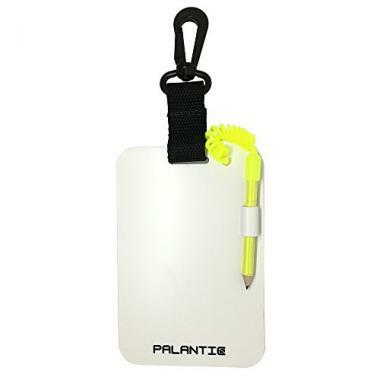 The size of the dive slate determines how often you are able to communicate, how large you are able to write, and how easy the dive slate is to store. With every piece of equipment being something extra to carry and worry about you want to make sure that you’re not carrying anything you don’t have to. With that in mind, people who often find themselves chatting to a friend, or somebody who needs to communicate with a larger group are going to need different sizes of slate. Similarly, a diver looking to record detailed notes may need multiple pages. Why are you going to be writing underwater? How important are your notes and how often are you prepared to return to the surface? The average diver shouldn’t need to communicate that often but when you have to you, it’s best to know you have it available. Many people find the magnetic dive slates are the best solution to sending short messages that can easily be erased, allowing you to use the dive slate again. What’s your budget? The more time that you spend underwater the higher this should be. There is no point skimping out on the price, only to find the product that you have bought doesn’t suit your needs. 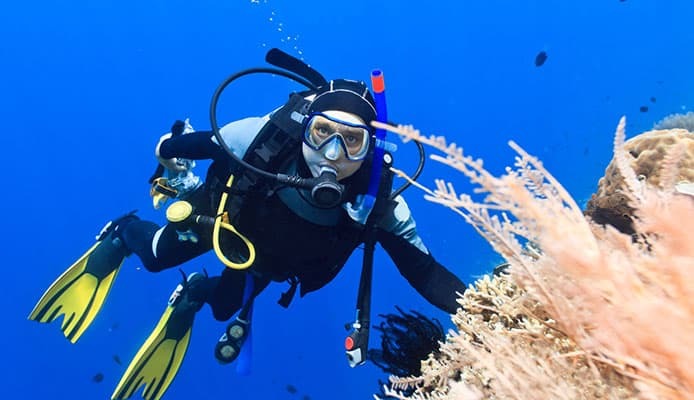 Think carefully about how you plan on using the device and recognise that this is probably the least amount of money you will spend on any piece of dive gear. When in a dive situation, sometimes what may seem simple and insignificant perks on the surface become incredibly useful. Q. Why use a dive slate? 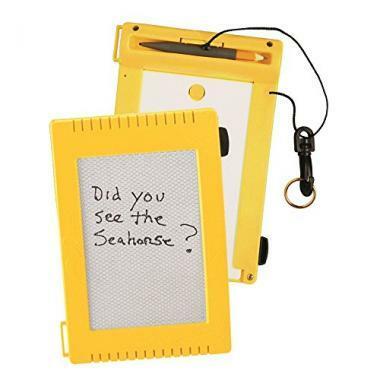 A: For first time divers, a diving slate may simply be used to send excited messages to a buddy. However, as you dive more often you may find yourself being able to write down the different species of fish that you see, writing a map for yourself to follow when underwater or recording any number of observations. Whatever the case all divers would agree that some messages can simply not sent through arm and hand signals. Q. How to clean a dive slate? A: This firstly depends on the kind of dive slate that you have. The majority of dive slates can be cleaned with rubbing the plastic, either with your hand or sand. Sometimes however this does not produce the optimal result. Many divers confess that typical plastic dive slates are difficult to clear whilst underwater. When returning the surface dive slates are easy to clean using rubbing alcohol, magic erasers as well as everyday erasers. The more care you take over your dive slate the longer it will last and the easy it will be to read when you get below the surface. It is worth taking the time when on dry land to properly clean your dive slate so that when underwater your messages show up clearly. Magnetic dive slates, on the other hand, are cleaned more simply and can be cleaned off easily underwater. Because the slate is magnetic, at the press of a button it can be wiped clean, ready to be used again. Although they may not seem as important as a dive watch or dive computer, the simple technology of a dive slate certainly has its place. More time spent underwater quickly reveals how a diving slate can be useful. Furthermore, anyone who has spent significant time diving can really appreciate how simple tricks like a buckle to enable quick release or wrist strap can save time and stress when underwater. All of the dive slates on our list are fit for function, by taking the time to think what you’re going to need in a dive slate, you will be able to pick the right one.